Anyone who comes by plane from the west in an easterly direction will notice a clear change to the landscape after crossing the River Elbe. The countryside becomes more extensive, and it’s especially noticeable that the fields become larger. The area beyond the Elbe is the land of the large agricultural manor estates. At the beginning of the German eastwards colonisation in the twelfth century, a cultural and natural landscape developed which is unique in Europe. The knights, who came to the country along with Heinrich The Lion, were mainly rewarded for their commitment in battle against the Slavs with parcels of land. Over the years this service gentry merged with the noble Slavic clans and a relatively down-to-earth form of Mecklenburg nobility was formed. It’s no coincidence then, that the same family names appear again and again amongst those who received grants of land from the later landlords, the Mecklenburg dukes: The Oertzen, Maltzahn, Bülow, Plessen, Hahn, Bassewitz and Blücher families thus became great land owners. Although the agricultural exploitation of the properties was restricted to a few estates in the beginning, this situation changed drastically as of the 16th century. The 30 years’ war, which also saw great losses among the population in Mecklenburg, caused a further increase in the land ownership of the nobles. 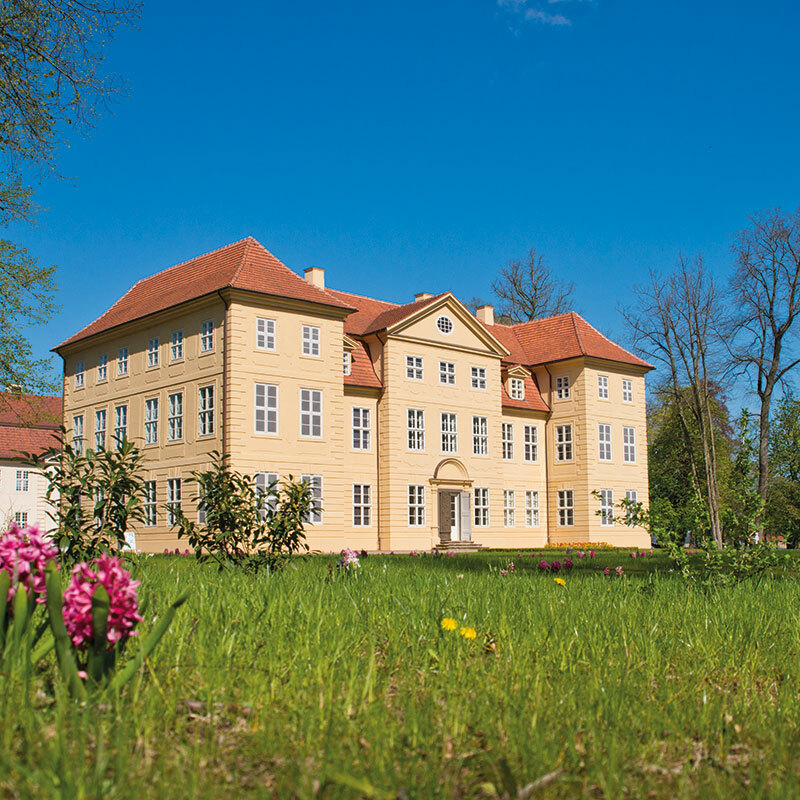 By the end of the 18th century, the typical, large noble manor estate was established as the dominant feature of the Mecklenburg countryside. One-dimensional farming villages were seldom and had been largely replaced by the manor estate villages, which had become characteristic of Mecklenburg. The manor house was the focal point of the village, the various farm buildings, the dwellings of the estate workers, the church – often a patronage church of the lord, and the parks, often rambling over large areas. These building collectives embedded in the wide-ranging Mecklenburg countryside remain to this day the definitive characteristic of the state. The political and social orientation to the East-Elbishe manorial structure changed over the course of history. One thing is clear, however, it worked like a well-oiled machine for hundreds of years. Halting the seemingly unstoppable decline of the historically fascinating manorial collectives only became remotely possible in the time after 1945, and wasn’t truly practicable until the post-1990 separation of the buildings from the land. It still isn’t too late to preserve a large part of this treasure, which offers enormous touristic potential for the state. Every preservation begins with active use, so each and every use of a manor house - or even parts of the manor estate - should be warmly greeted and supported. The "day trip guide to 100 mansions and stately residences waere nobler" you should contribute to this aim. 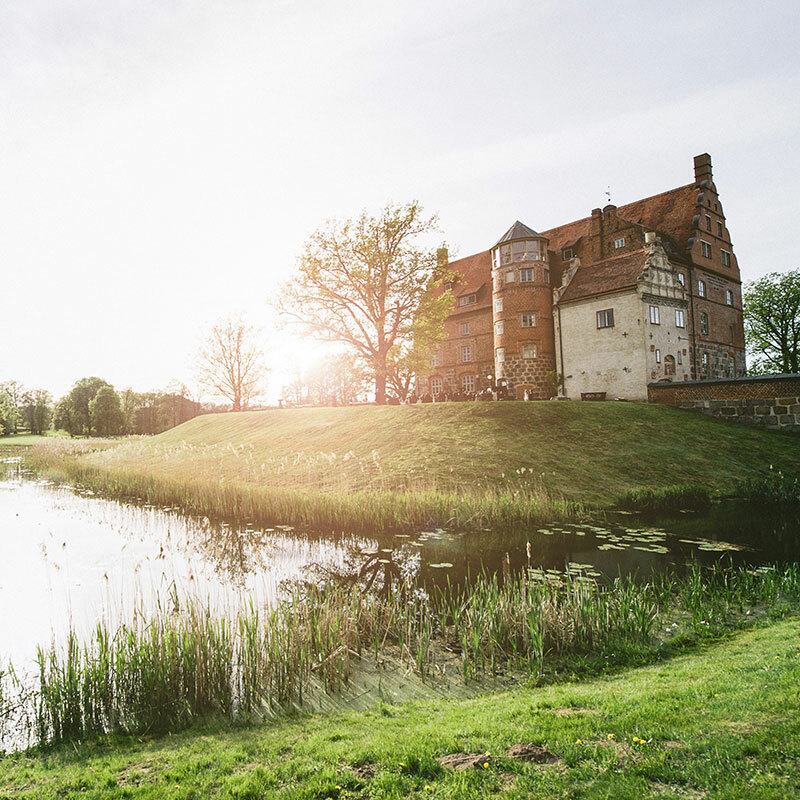 The Mecklenburg Lake District represents a glowing example for the entire East Elbe region. the typical manor style of the area. The land reform in 1945 separated the manor houses from the agricultural areas and thus the houses lost their economic basis. On the other side of the coin are the mansions. These were typically the residences of the state ruler. (The word castle or palace often appears in this context as a result of the ambiguity of the German „Schloss“) In the Mecklenburg Lake District the residences in Neustrelitz, Mirow and Hohenzieritz are such houses. The latter was built as a manor house and later purchased by the lord of the state. Some manor houses were colloquially known as castles because of their architecture or tradition. The Neustrelitz mansion was constructed between 1726 and 1731 as a three storey, baroque, timber-framed house. It served as the main residence of the ruling Duke Adolf Friedrich III from Mecklenburg-Strelitz. In 1945, it was almost completely destroyed by fire and later the ruined parts removed. 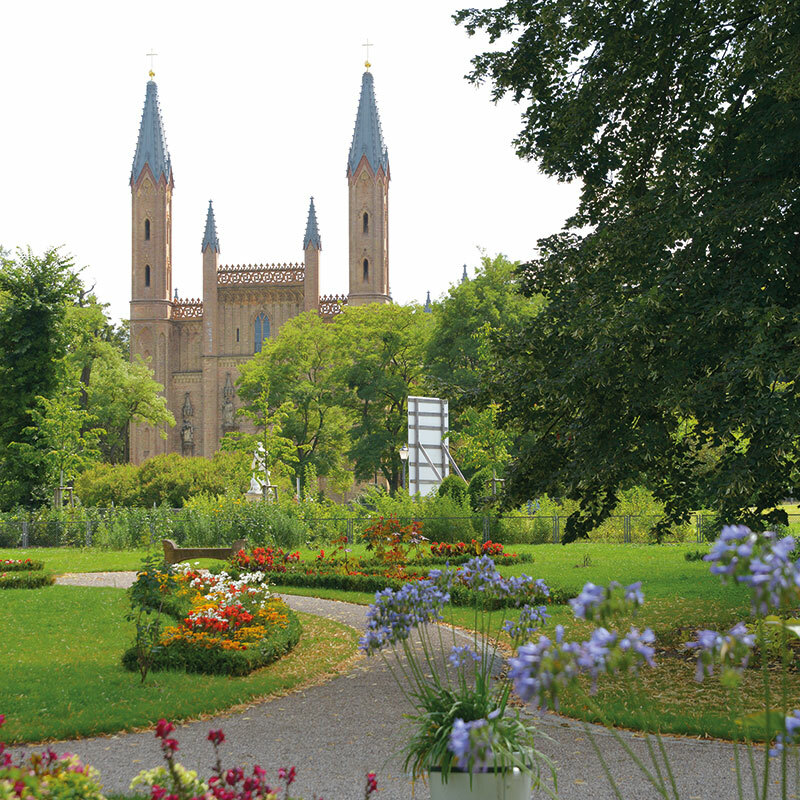 Remaining were the picturesque mansion garden-ensemble with its many sculptures, fountains and old trees, as well as the neo-gothic mansion church, the classicist orangery, the stables, the temple of Hebe and the memorial hall of Queen Luise of Prussia. The late baroque town complex is unique in Europe. The eight streets leading from the square market place form an impressive star formation. A two and three storey plain rendered building, the residence was built in about 1709 for widowed members of the ducal Mecklenburg-Strelitz families. The crowning glory of the building is the baroque banqueting hall. The most famous resident was Sophie Charlotte. She spent her childhood in Mirow, and when she married George III, became queen of Great Britain and Ireland. On the palace island is a small baroque park featuring the so-called „love-island“. A welcome centre and café are situated in the gentleman‘s house opposite the Palace. The Renaissance style gatehouse and the Johanniter church, in which the family crypt of the Strelitz ducal families was situated, are also not to be missed.